Brother SE400 vs SE425 – Which one Should You Buy ? Bother is a Japanese multinational company which is so trusted and reliable brand for electronics and sewing machine. In this post we are going to discuss about it’s two highly rated sewing machine Brother SE400 and SE425. Since you are on this page, you have done a thorough research and you are planning to buy Brother SE400 or Brother SE425. These are not just a normal machine, Both are very much efficient for embroidering as well, It let you decorate crafting project with great ease. Due to lots of interesting features both of them are the best choice for those who are intermediates or the expert sewists. In these machine you will get everything which you can expect in this price range such as easy threading system, easy thread cutter, top drop-in bobbin system which is very easy to set up. Both of them have 4×4 inch embroidery area that is designed to utilize for making embroidery designs. If you want larger design you will need to split this design first, and then reposition that hoop but don’t forget that you can not fit in larger hoops. So in this hoop size both offer limitations, if you want bigger hoop size you can check Brother PE770 that comes with 5×7 embroidery area. Both Brother SE400 Vs SE425, comes with computer connectivity, it let you important more design. Both some with .pes and .dst file format so check before importing it. There is many sites where you can download including Brother’s official embroidery design website iBroidery.com. There is very less memory in both sewing machines so you can import limited no. of design. You can delete design to free storage if you want and download it again whenever you want. This is really an exciting features in both the sewing machine, that add more value into it. It is very frustrating to thread the needle but thanks to it’s Automatic Needle threader, it does it automatically. Not only this, it has also thread cutter that makes it more fun to sew clothes with these sewing machines. I have already told you that these are very identical, all the features are almost same and now we are going to talk differences and i am pretty sure that you might be excited to know difference. So let me clear one thing there is no big difference in features or design between Brother SE400 and Brother SE425. 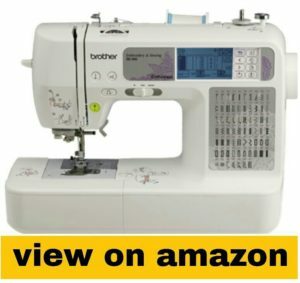 Both Brother SE400 and Brother SE425 comes with with 70 built-in embroidery designs but there is one additional advantage to buy Brother SE425 is it comes with a CD which has 100 additional embroidery designs. So basically SE425 has 170 embroidery designs. But this isn’t so big features because you can import these designs in SE400 too just by connecting to your computer. So, basically both are same in this context too. This is the real difference between Brother SE400 and Brother SE425 is price. Yeah SE425 cost you 40-50 bucks extra than SE400. Therefore buying Brother SE425 will be a wise idea. You might have already got the idea which you should take & It is Brother SE400 because it cost you less than SE425 and both are exactly same. There is only one extra advantage of having SE425 that’s 100 embroidery design CD. You can easily import many design in both machine though computer. So our recommend product is SE400 that’s #1 bestseller sewing machine of amazon. Both Brother SE400 Vs SE425, is powerful, high-end computerized sewing machine that’s packed with ultimate features. In the price segment it’s hard to find such sewing machine. It is not only a comparison post, here we tried to share own opinion and review about these product alongside with comparison. There is no big difference in both if you will purchase any of them you will be totally satisfied by it.